I was in Devonport (a nice little 'village' on the North Shore of Auckland) on the weekend, visiting a good friend who'd recently returned from several years living in the UK. While waiting for the ferry back to the CBD, we were browsing the nice second-hand bookstore in the ferry terminal. Turns out she's a crime fiction fan, and she picked a Peter James book. Now, I shouldn't really be buying too many (cough, any) books, because I have a gigantic TBR pile already, to review etc. 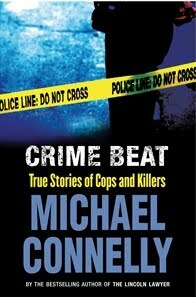 But when I came across CRIME BEAT: TRUE STORIES OF COPS AND KILLERS by Michael Connelly, I couldn't resist. As a crime fiction writer, Michael Connelly has been one of my favourites since I stumbled over THE POET in a bookstore several years ago. But as many of you may know, before he was Connelly the crime writer, he was Connelly the crime reporter. He was an award-winning journalist before he became one of the leading crime writers of his generation. CRIME BEAT includes several of his 'true crime' stories from his days as a reporter in Florida and Los Angeles. As the blurb says, "These true stories help to chart the development of his work as a novelist - guaranteed to make fascinating reading for any serious fan of crime writing." As Connelly himself says in the introduction, "One morning an editor called me and told me to swing by a murder scene on my way to the office. Just like that, I was picking upa coffee on the way to work. The murder was on Woodrow Wilson Drive in the Hollywood Hills. I went as instructed and got the story. I also got the place where I would put the home of the fictional detective [Harry Bosch] I had secretly been writing about ..."
I don't read a whole lot of true crime, but this was a book I just couldn't resist. What about you, dear readers? Are you Connelly fans? Have you read CRIME BEAT? Do you like true crime as well as fictional mysteries? Do you read non-fiction from your crime fiction favourites (e.g. THE INNOCENT MAN by John Grisham, PORTRAIT OF A KILLER by Patricia Cornwell (if that could be called non-fiction))? I really don't like true crime much. I read the book that Ann Rule wrote about Ted Bundy a few years ago and although it was good I just got depressed reading it so I haven't bothered with true crime since then. I like being able to close a crime fiction book and think "how icky...glad it was only make believe" and you just can't do that with true crime. I enjoy Michael Connelly's novels, and I thought, ooh, I must get Crime Beat, that looks great. Then I realised, actually I own Crime Beat, and it had been hidden under a stack of books, and I must confess to having completely forgotten about it. I do like reading true crime as well, but find I have to read it in small doses, otherwise I feel icky. Craig - I don't read a great deal of true crime. I'm not sure exactly why, although there's probably some deep-seated thing in my psyche that wants to keep a distance from the horror. But Connolly's a great writer, and this book sounds interesting. Might be time to add some true crime to my TBR list.